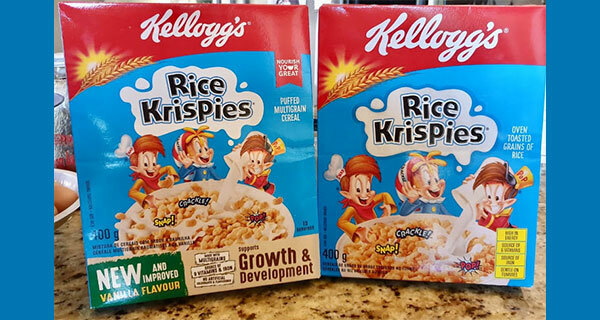 What has prompted Kellogg’s South Africa to radically change the recipe of its iconic Rice Krispies? Doing so has generated scathing criticisism from hundreds of South Africans, reports leading consumer journalist, Wendy Knowler. The product has gone from rice to “multigrain”‚ a “vanilla” flavour has been added along with twice the sugar‚ and to top it all‚ the famous snap‚ crackle and pop has disappeared, she excoriates. Many of the more than 500 consumers who have shared their outrage on the company’s Facebook page have accused it of “tricking” them into buying the “new‚ improved” Rice Krispies (pictured left) by not making it clear that the product is entirely different. What prompted what appears to be a radical change‚ which is not adequately reflected on the packaging? Why the change‚ and why so much more sugar (from 9% sugar to 21%)‚ when globally food manufactures are reducing the sugar content of their products? Did Kellogg’s SA do any local market research before changing the formulation? Responding‚ the company’s director of research‚ nutrition and technology‚ Xolile Mbatha‚ said the “new‚ improved” Rice Krispies‚ introduced to the market last month‚ was indeed tested on consumers first. The test group included “both existing Rice Krispies consumers and those who had lapsed or had never consumed it – all of them mothers and their children”‚ she said. “While we understand there are differences in everyone’s taste‚ the results from this market research indicated that the Rice Krispies Vanilla concept and food was significantly liked by all consumers‚” Mbatha said. The move from a single grain (rice) formula to multi-grains allowed Kellogg’s to source all their major ingredients locally‚ she said‚ “whereas previously we imported all main ingredients”. Rice Krispies Vanilla did have “a thin coating of sugar” to enhance crispiness‚ Mbatha said‚ equivalent to 1.5 teaspoons per serving. Kellogg’s restricts the sugar content of its products to no more than 33% (33g per 100g) of sugar‚ and the new Rice Krispies Vanilla was developed within these guidelines at 21.7g per 100g‚ she said. As for claims that the new pack is easily mistaken for the familiar decades-old one‚ Mbatha said the company had “made every effort to clearly state the new and improved vanilla formula on Rice Krispies Vanilla package”. “In order to improve consumer awareness of this new Rice Krispies Vanilla‚ we are conducting sampling in stores and we will be expanding the sample base over the coming months‚” she said. Kellogg’s Coco Pops is also getting negative reviews, says Knowler.